The world these days is plagued by environmental ignorance. Of the entire field of Republican presidential candidates in the US, John Kasich is the only one not in lock-step with the climate change deniers. Yet even though he appears to accept that climate change is real, he still insists that we do absolutely nothing about it. I am praying fervently that young people show up at the polls, and put stupidity to rest. It is amazing how the candidates are so engaged in their twitter feeds, cell phones and digital apparatus but then deny the validity of the science that made it all possible. Very few scientists question of the reality of climate change and its causes and effects except those who want the polar ice caps to melt so that they can get at the riches they hope to find under the ice, come hell and high water, both. I have learned of a couple good books that should help to change the way people think about the outdoors. One is How to Raise a Wild Child: The Art and Science of Falling in Love with Nature, by Dr. Scott Sampson. Like Richard Louv's book, Last Child in the Woods, it points to the necessity that children become fully immersed in nature. Another book, that's even more up my alley has not yet been published in English, but has been a best seller in Germany. The Hidden Life of the Trees by Peter Wohlleben reveals that our forests are alive and interconnected in more ways than any but mystics have been able to see so far. I have previously mentioned the early history of Freidrich Froebel, and that he had been a forester's apprentice long before going to university, and several decades before inventing Kindergarten. What he hoped to teach and awaken through his model of education was the sense of wonder that led children to discover their own inter-connectedness in the field of all things and all life. Sadly, that kind of mystical wonder has been pushed aside in education to make room for statistical analysis and standardized tests. And so when I use the term environmental ignorance, I wish I were doing so in jest rather than so directly to the point. As you can see in the photos, my demonstration boxes are evolving nicely. Make, fix, create and extend toward others the opportunity to learn likewise. Today in the wood shop I began making more sample boxes to take to Portland for one of my upcoming classes there. A lesson I've learned from Educational Sloyd, but also from working with children and adults is that we learn best from concrete objects and from concrete hands-on experiences. So when I travel to teach, I travel with boxes that my students can hold, examine, pass around and copy if they like. If I want my students to make something, there is no better way to assist their vision of how to make it or how they would improve upon it than to offer one of my own. Yesterday afternoon when I went to the grocery store, I saw one of my students who said, "I wish I had all day, everyday wood shop." He's not the first to have said such a thing. And of course the reason for it is that students of all ages have a need to do real things, and you can't get much more real than to use real tools to make real things from wood. I was reminded of developmental psychology this afternoon at a staff meeting when my fellow teachers were talking about their their own children and when new teeth arrive. Fortunately teeth generally come in at the right place, but the timing can vary widely just as does every other aspect of human development. The following is from a website, noting the relationship between capacity for intellectual development and development of the brain. The tragic thing here is that education in America makes far too little allowance for the variations in human development. If you are a "late bloomer," you'll be lucky to escape schooling with any sense of academic self-confidence in tact. The important thing to note is that even adults do not outgrow the necessity of concrete engagement even though they may have far surpassed the age of 15 and are fully capable of abstract thought. But take my student as an example. Nearly 15, he already knows what he likes, why he likes it, and how wood shop compares with other forms of learning, whereas many or perhaps most children may never know. If school were to focus more on concrete learning, students still not in the formal operational stage would at least have some fighting chance of understanding their own capacities. 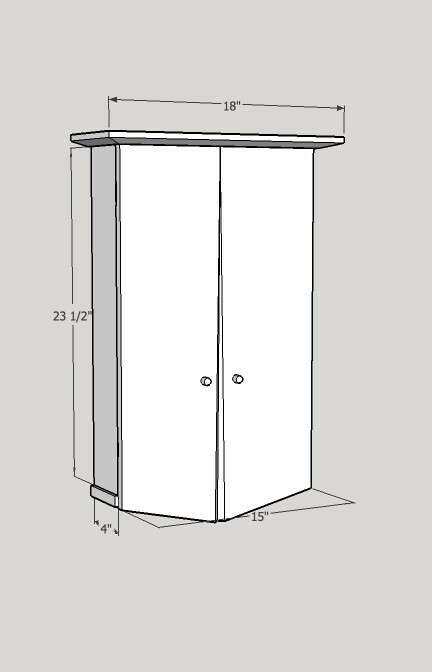 On the boxes shown above, can you imagine how beautiful the figured walnut panels will be framed in cherry and white oak? Can you imagine what it means to kids to have the opportunity to create useful beauty from their own imaginations and from the tools and materials at hand? My classes in Portland with the Guild of Oregon Woodworkers have been posted for enrollment on their website. You will find class descriptions here and my usual readers may be particularly interested in the symposium for educators or those who might like to teach woodworking. 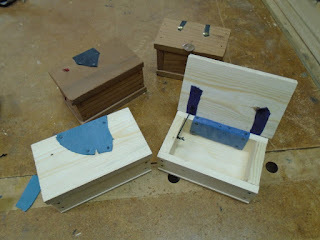 In my shop, I've been planning two boxes for students to make in two of the classes. One is in the Greene and Greene style with finger jointed corners and lift lid, and you can see my prototypes with corner joinery complete in the photo above. I am also working on a larger box in a different style that will be more complex for a two day class, working on a safety section for a compilation of my first two books, outlines for two articles for Fine Woodworking, and a proposal for a program at next year's ISACS conference.Today, I will balance my efforts between my office, school and the wood shop. If you are in the Portland, Oregon area, this series of classes may interest you, and if you have questions about the classes, you are welcome to contact me through the comments function or via email. 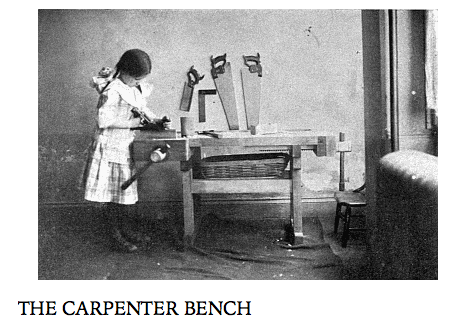 What follows is the kindergarten poem that celebrates the carpenter. Busy is the carpenter; At his work he stands. Oh, the wonders he can do With his skillful hands. And the rough is quickly smoothed When the plane he takes. Dz.... dz.... Rap, rap, rap, rap, rap! Oh, the wonders he can do With his skillful hands! Curv'd he changes into flat; Wondrous skill he shows. "Here a board and there a board; Pray, what use are they!" Nails the boards and timbers fast; How his hammer rings! And for this the grateful child Love and thanks will give. Make, fix, create and extend to others the experience of learning likewise. Yesterday was intense as my students worked on their box guitars, and as upper elementary school students worked on their long list of tools for their class travel coming up in April. For that, they need rock exploration tools: mallet, chisel and seive, a mineral collection box with dividers and a cutting board map of the state. So I have students working on various aspects of these projects at the same time, and I've been asking them to help each other more instead of asking me to advise on every little thing. Last week I had an extended conversation with Ben Kellman who is current president of the North East Association of Woodworking Teachers (NEAWT). He laid out several points that he considers his elevator speech... If you only have the amount of time that you spend in an elevator to make your point, what can you say to convince a skeptic of the value of woodworking education? 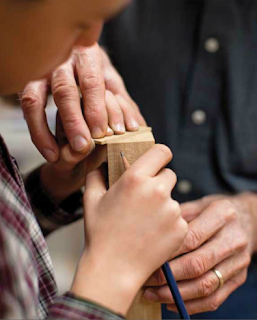 So quickly, here are five points... Woodshops safely transfer skill between generations. Students learn to plan and engage creatively in making. Students learn how to fail successfully in a supportive environment that encourages them to risk doing so. It is active (which is extremely appealing to students). And it offers opportunities for collaboration. I have not stated these as eloquently as Ben, but I'm hoping you can get the point long before we get to the second floor. Collaboration comes into play all the time in wood shop as students work together and help each other. But the wood shop also provides the opportunity for staff collaboration as we plan ways to work together. One of the things I'm working on with our upper elementary school teacher is a presentation for next year's ISACS conference in Columbus, Ohio. We will use the current wood shop project with her students to explain hands-on learning, and its integral, collaborative purpose in the school at large. The photo above shows some simple prototypes of boxes for this week's class and earlier boxes that I kept in the shop as examples from earlier classes. The redwood box at upper right is from my first experimentation with this type of hinge. Kids love boxes and making them, and many of my students of all ages have boxes at home that they made in the school wood shop. Make, fix, create, and extend to others the possibility to learn likewise. alternation between rectilinear and curved objects. In discussing curved vs. rectilinear forms with Richard Bazeley in Australia, I remembered a question that I had about the arrangement of sloyd models, as rather than proceeding as exactly as one might expect having to do with order of difficulty, they would jump from square assembled objects to delicately carved ladles and spoons and then back. There was obviously something more going on in the arrangement of objects than the progression of ease with which they were to be made. The following from Salomon's Teacher's Guide helps to clarify. 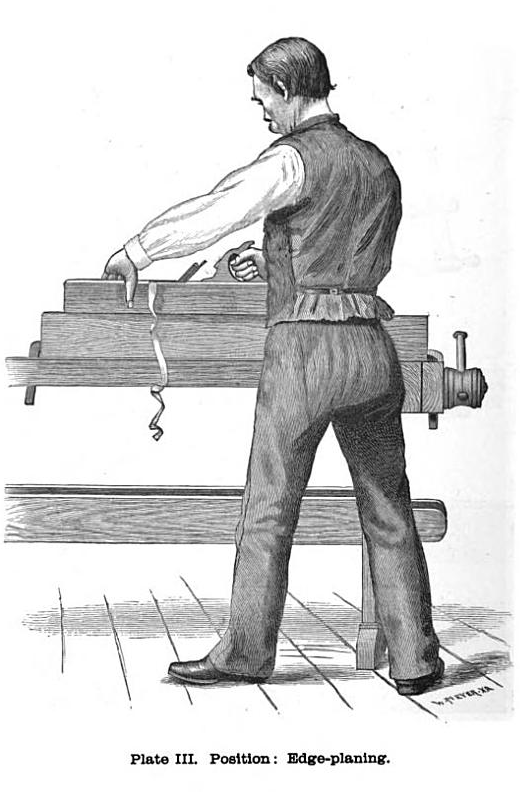 The articles which are included in slöjd carpentry consist partly of "modelled" articles bounded by curved surfaces, and partly of rectangular articles bounded principally by plane surfaces. It is very important that any arrangement of models in a series should present good alternation between these two kinds, and, generally speaking, a modelled object should follow a rectangular object and vice versa. As a result, each model acquires to some extent the charm of novelty, and this still further increases in the pupils that interest for their work which is the very greatest importance as regards the educational benefits to be derived from sloyd. The point that Salomon makes here is that educational value rests upon the interests of the child. Yesterday in my lower elementary school class I had only two students and they were so excited about the project I had in mind, and that I showed them an example of before class. The photo above shows the finished projects (and they insisted their boxes be finished in a single day, such was their enthusiasm for the objects made.) What made things sweeter yet for them was the admiration the older students showed for what they had made as they were leaving class. The project gave me the opportunity to test my new cut-off box. 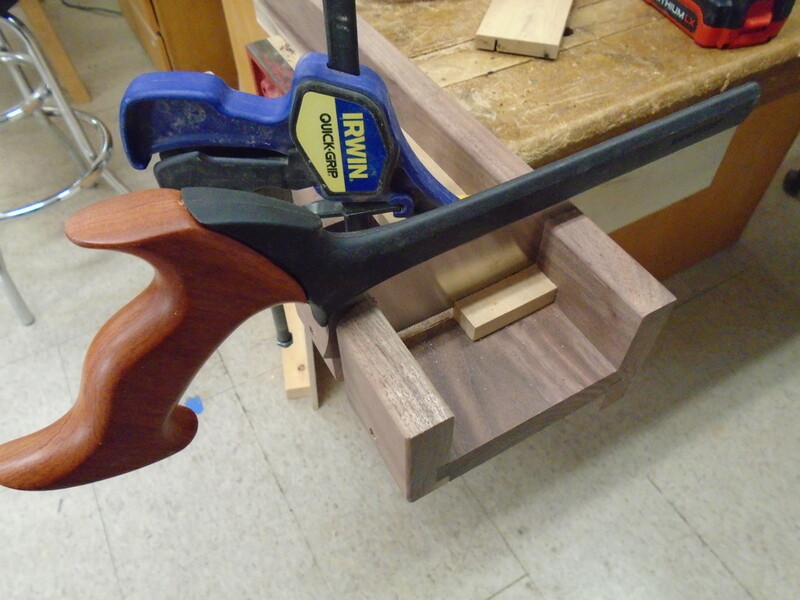 I found that the one that clamps in the vise works better than the one that clamps to the table top, but both work. Make, fix, create, and extend to others the capacity and inclination to learn likewise. 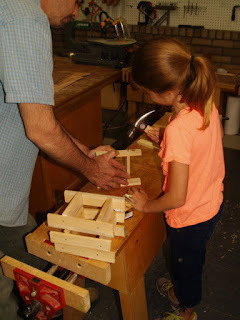 Yesterday as I was trying to keep my students supplied with the right tools and right steps at the right time for their various projects, I assembled and tested a new design of bench hook or miter box that I hope will allow my youngest students an easier time in making square cuts in equal lengths. The bench-vise version of the device worked great, but I learned that for table top use, it requires a lip across the front to bring it tight and square to the front edge of the table in order to make the clamp as effective as it needs to be. I'll test a new version of the table top device today with my lower elementary school students. Richard Bazeley in Australia has also been experimenting with designs and perhaps in time some absolute perfection will emerge, or perhaps that's unlikely. I see the bench hook/miter box jig as being a tool like any other tool. We design them to make things easier for us, and to require less attention and less skill. Just as Einstein noted that with his pencil he could note long equations without having to secure the full stream in his head, a bench hook can hold the saw just right, and the wood just right, to alleviate the attention of the hand and mind on the cut. And so when we begin to understand tools in the correct light, we begin to see that humanity is a broad continuum that should not be segregated into artificial classes. If the academic class and the wealthy class were to acknowledge their own relationship to tools, they might be more curious about the world to which they have denied themselves access. If the working class was to see tools in their clearest light, they would not longer be under the thumb of those who would repress them. I continue to experiment with ways to assist elementary school teachers and for that I'm making some new 90 degree cut off boxes for use with dovetail saws. They work like miter boxes. In the photo you see the various parts for 4. Two will be versions that can be clamped in a vise, and two will be used with a clamp on any table top or bench. A friend sent me a yet to be released video on woodworking at the Eliot School in Jamaica Plains. I'll be able to post it on the blog after the official release date, their 340th anniversary in April. What I had noticed int the video was that with miter boxes clamped to the table top, students struggled to hold the stock firmly in place as it was cut. 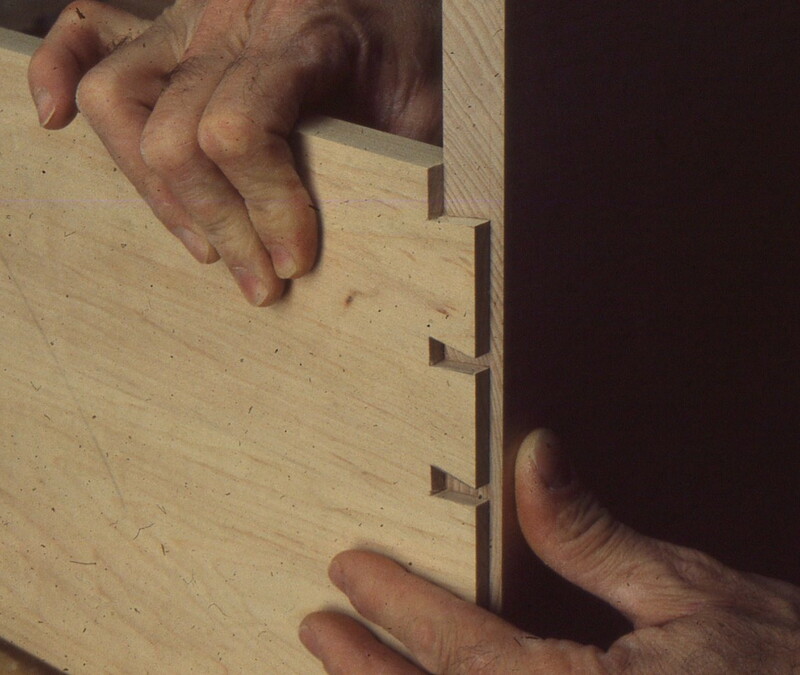 But what if the same clamp that held the miter box to the table also held the stock in place? I'm making prototypes to test in the Clear Spring School wood shop. I'm making two that can be clamped in vices and two that clamp directly to a table top or desk and that could be used in any school. If these work as I hope, I will make my sketchup illustration and cutting list available. The extended fence at the back allows for stop blocks to be used to cut parts of equal size. What I hope can come of this will be more hand tool box making. 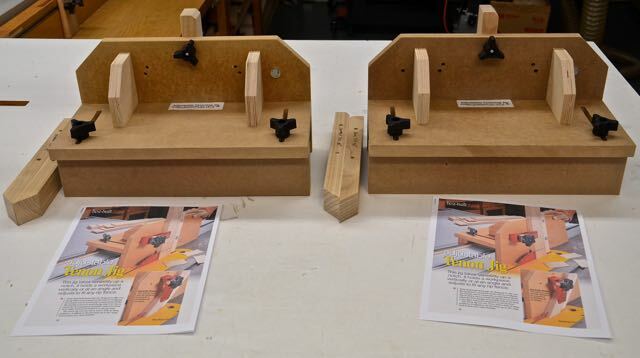 Boxes require square cuts and equal lengths and this jig with a stop block can help. Make, fix, craft, create, and extend to others the a chance to learn likewise. Last summer at Marc Adams School, my assistant Jerry and I announced an end of the year challenge box making contest in which students from the two classes were to submit boxes for judging by Jerry and I. My students in the first class asked that the two classes be judged separately because the second class was to "take boxes to the next level" and was intended to engaged many of my former box making students in building upon the box making skills they had earned in an earlier class. So two first and two second place prizes have been awarded. From the first class winners were Ken Nimmons and Gil Fuqua. and it was extremely difficult for us to choose between first and second place. Ken submitted photos of a jewelry box and Gil submitted photos of several boxes each well done. Our first place award winners, Ken and Rich were each given shop made table saw tenoning jigs made by Jerry Forshee, along with a small box from my upcoming book and an x +/- 2 proportioning block made and signed by me. 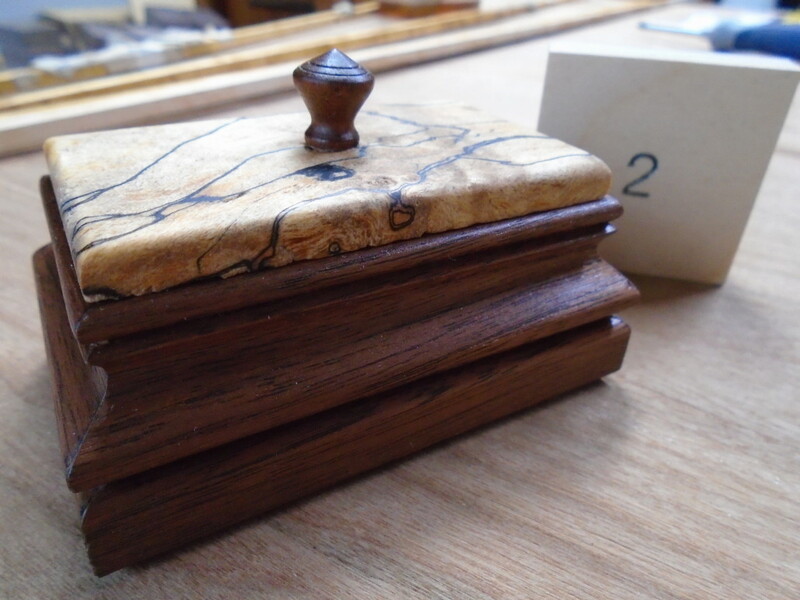 Our second place winners, Dan and Gil each received hand crafted tiny boxes and a signed proportioning block. 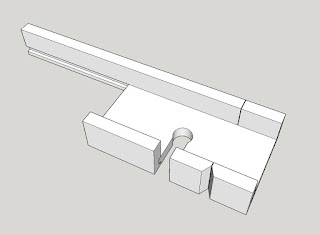 So what is an x+/- 2 proportioning block? You can learn about it and how it can make your boxmaking easier and faster from my book Beautiful Boxes, Design and Technique, or attend one of my classes. My x +/- 2 blocks have a rare earth magnet on the back so it can be kept handy at the table saw and not be swept away with the scraps. Of course, you can use a 2 in. square piece of scrapwood to serve the same purpose. Make, you own! What a lovely idea! Congratulations to our skilled winners! A couple years ago a writer did an article about my program at the Clear Spring School and suggested that since the magazine no longer keeps it on file where it can be read, that I scan it for the limited readership here in my blog. The article is called "Wise Hands" by Ragan Sutterfield, and can be downloaded here. a quick shot from memory lane. I spent part of the day yesterday digging through boxes and albums of slides trying to find photos from the first chapter of my first book. In going through all my slides for my first two books, the editor discovered that some were missing, and evidently they had been misplaced. I knew, however, that I had considered my slides for my books to have possible importance to me at some point, and had not thrown them out. But with my having written quite a few articles for woodworking magazines before the days of digital photography, the shear volume of slides to go through was daunting, but I found them, scanned them and sent them off for professional handling. We also learned in the process of trying to reassemble two books from one, that an earlier editor had made the decision to cut a large portion of one of my boxes from the DVD compilation we were relying upon for the text. But, what things are as easy as we might hope? Fortunately, I have been assigned an editor in this case who is helpful and good to work with. His efforts will make the book one that will be useful to readers, and one that I'll be proud of. A television station in NYC has done a brief video report on the school in Manhattan, Harvest Collegiate where my daughter Lucy teaches. It is an experimental school that is trying to demonstrate some learning concepts that would not be allowed in most urban public schools. The motto of the school is "Every Student is an Intellectual." Personally, I would add the notion that craftsmanship is an intellectual process and that full development of intellectual capacity only arises where the hands and mind are harnessed in partnership. Tipping his hat to his hands, even Einstein said, "my pencil and I are smarter than I am." Tipping my hat to Harvest Collegiate, I will note that my daughter will be teaching a special class on cooking for the next two weeks. You've probably noticed that I'm a woodworker and not a child psychologist. I suspect that I have more fun, than many developmental psychologists because I get to make real things from wood. I think it would be particularly distressing for developmental psychologists to watch education in America while having so little control of how things turn out. It appears that the last ones educational policy makers pay any attention to are those who've studied how children learn best, and what they need to grow and develop to be successful and caring adults. I, and many of the readers of this blog, have the capacity to take learning and education into our own hands while developmental psychologists are kept at arms length. Unless you are one of the many who can't listen to my spiel on a daily basis (I repeat myself and offer no apology for it), you will know that I was discussing the relationship between the concrete and abstract, the necessity of concrete learning, and the developmental stages described and named by Piaget, one of the world's foremost and most widely accepted child development psychologists. Nice to hear from you, Doug! The short answer to your question is yes, you can use Piaget to make the argument for the hands. His theory proposes that the sensorimotor activity of the first year of life is the same process as is used in every area of thought for the entirety of life. The content changes but the process is the same. His approach is broader than the hands themselves, but they certainly would continue to be a significant part of thought development for the life span. The point Dr. Feldman makes (and that I've made before) is that we never outgrow our need for engagement in concrete reality, and that Piaget provides a sound foundation for that belief. Even those students who reach the formal operational stage at a particularly early age (making it easy for those who want to cram knowledge into the brain through books and digital devices), still benefit from having concrete resources available for their examination of abstract reality. So while many educational policy makers would like to deliver education effortlessly to your seat or desk top, and thus achieve education on the cheap, we on the other hand, being messy human beings as we are, need a simple and more messy educational mechanism that allows us to do real things. The arts, music, laboratory science, and yes... you've been waiting for it? Wood shop! The box and x+/-2 block shown in the image above were sent yesterday to one of the winners from my box making contest. forming an alliance of hands. I had the day off from school yesterday due to icy roads (today, too! ), so I was able to ship a box to Fine Woodworking for a product review and finish 10 tiny boxes, four of which will go to winners of a box making contest. 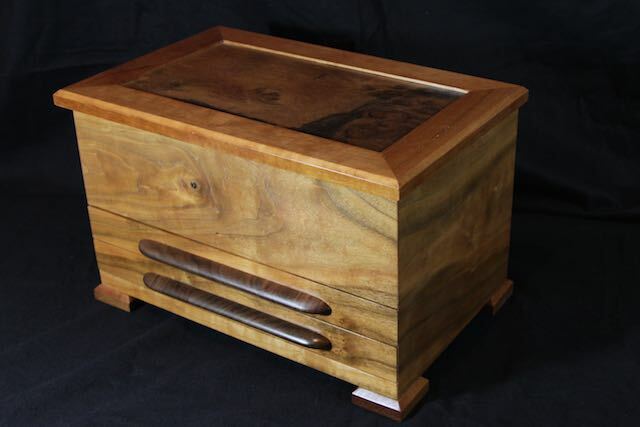 I also learned that Popular Woodworking Books hopes to send my book Build 25 Beautiful Boxes to the printer at the end of February for distribution in June. I've not mentioned this book before because it is actually a compilation of projects from my first two books that had gone out of print. Schooling as it is practiced now in too many schools does not foster industry or lead to a predisposition toward industriousness. Most schools set for themselves the goal of pushing kids along a track into college, so that the ultimate success or failure of their students will be measured elsewhere down the line. But there are things to do to reshape American education that are not completely new. I'll remind you of music, of the arts, of laboratory science, of field trips, of nature study and athletics. And, let's not forget wood shop. What we need is an alliance of hands. We need science teachers, art teachers, music teachers, physical education teachers, math teachers, history teachers, literature teachers and reading specialists to all rise up along with woodworking teachers at the very same time in recognition of what the hands do to incite learning. I seem to be stuck making boxes. On Monday I installed hinges for a demonstration box for a Fine Woodworking product review article on "side rail hinges." 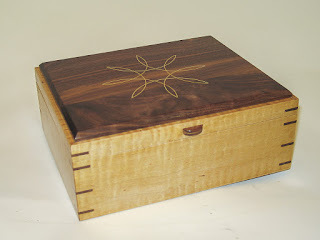 Now that the box is complete, I will send it to Fine Woodworking for them to photograph for inclusion in the review. To rout for the hinges to fit, I used my "flipping story stick technique," and found the accuracy of the technique to be spot on. I am also making some tiny boxes to award as prizes for the box making contests I offered my summer students from the Marc Adams School of Woodworking.There were two classes and first and second place awards in each class. So while there are only four prizes to award that require these small boxes, I will have just a few left over to sell. 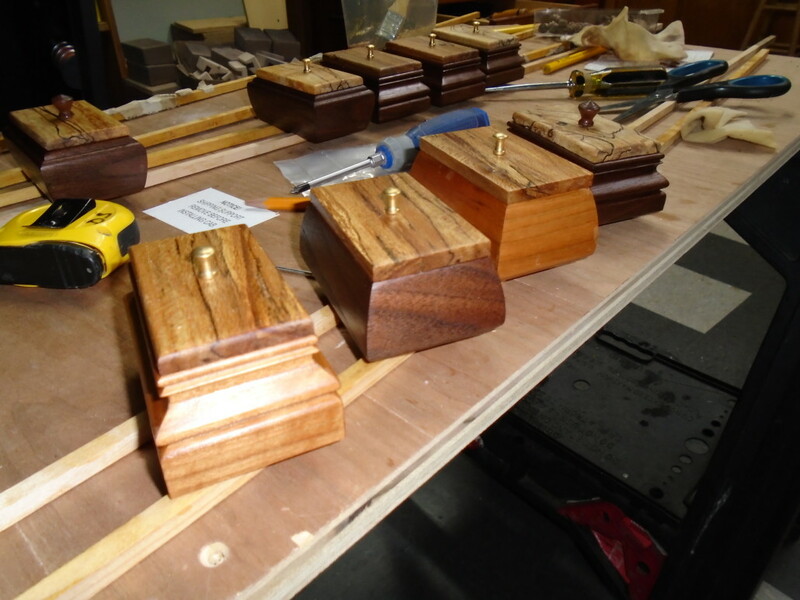 The lift off lids have been fitted to the bodies of the boxes, and after being routed and finished, small brass pulls will be attached. In the wood shop at the Clear Spring School today, I began giving a vocabulary lesson to my lower elementary school students, making sure they can identify the various tools they use. They really liked naming tools they knew, learning to spell their names, and learning the names of tools that they did not know. Again, Salomon's advice comes to mind. Move from the concrete to the abstract. Will children not more easily learn that which they can hold and use? When I suggested the vocabulary lesson to them I did not realize how much fun it would become, and they would not allow the lesson to end until we had a long list from the top of the white board to the bottom. We have room still (and tools enough) for another list of equal length. In 1854, a Swiss statesman named Schwindler asked his countrymen to answer a question. "How shall instruction in our elementary schools be freed from its present abstract method, and be made more conducive to true mental development?" The question was widely discussed and brought forth a number of intelligent responses. I have the answer for it if anyone was to ask. Do real things that engage the senses, and particularly the hands. The hands form the bridge between reality and mind, making real that which had been abstract. This same applies to all ages, so even when I teach adults, I try to make it hands-on so that they might learn best. But how can teachers make things real for their students? Let me count the ways.... Music, art, field trips, hikes in nature, laboratory experiments, dance, making beautiful and useful things, and making a serious effort to reduce the amount of time spent sitting at desks. Do the hands really form the bridge between concrete and abstract? Test it yourself and reach out to the real world. Make, fix, create, and extend to others the power to learn likewise. I contacted their director, hoping to get an update, and was very pleased to learn that they are going strong. I know that in the big scheme of things, 2000 students per year is only a drop in the bucket, given the vast number of students left creatively disengaged. But good things often start small. Eliot School was there at the beginning of the Manual Arts movement in the US, and if there might be a rebirth of it all, it would be a great place for it to start. I had visited the Eliot School in July 2012, and you can read more about the school and my visit there using the date links at right, or you can use the search function found at upper left. One thing of particular interest at the Eliot School is their history in relation to the Sloyd system of woodworking education. The Russian system had been introduced at about the same time, and what was called by some, the Boston Compromise was hoped to bring them into relationship. In that "compromise" the Eliot School became a model for programs throughout the US, in which Educational Sloyd would be practiced at ages 10-12, and then the Russian system would be used with older children. The compromise made some sense in relation to the movement from the concrete to the abstract, because older students would be better prepared for abstract learning, that involved working from drawings, and doing sample joints rather that building whole, beautiful and useful things. 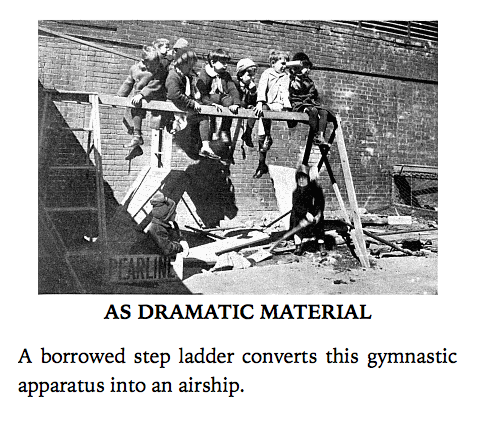 A very important pamphlet on all this was published in 1892 called the Eliot School Course of Manual Training, which you can download here. It includes an explanation of the necessity of manual arts training written by one of the first students at MIT, Robert Hallowell Richards. Richards was a famous and successful mining engineer and his wife Ellen Swallows Richards was one of the greats involved in the start of the Home Economics movement. They lived just a few houses down from the Eliot School. I was sad to learn yesterday of the death of a friend in Barrington, Rhode Island, poet CD Wright. I am reminded of how we are intricately connected to each other. One may craft wood, another raise a voice in song and spirit, another toil over the language we speak, and there are fine threads that connect us still. If you think you know CD (Carolyn) or would like to think you know Carolyn, please follow this link. As they say, the devil* may be in the details. And if someone had an understanding of developmental psychology, and was of malicious intent, he or she could hardly have designed a system of education worse for some kids than what came through the No Child Left Behind legislation. One clever thing that's been noted by some about the devil* is his ability to subvert honorable intentions toward sustaining injustice. No Child Left Behind (NCLB) may have been inspired by the idea that no children should be left behind and that schools should be a factor in helping children rise up from the academic indifference associated with poverty. On the other hand, an understanding of child development would lead one of good intentions to have designed a system that actually alleviated many of the overwhelming challenges that children from poverty face in school. The problem in NCLB was in the details. The idea was that if states and the federal government were to test kids and teacher performance, they could weed out bad teachers, reward the good ones, and pay specific attention to those children who were falling behind in academic pursuits. Standardized testing was thus pushed into lower and lower grades until even Kindergarten was affected. The problem with all that was readily apparent to those who have made a study of child development and the effects of poverty. Through book learning, lecture and educational implementation of digital devices, children of all ages, in almost all schools and regardless of personal situations are pushed into abstraction that they may be developmentally unprepared to utilize or understand. So, what follows is just a bit of what we know about child development and if we know these things, I'll ask why would we design schools in which children are required for so much time to sit idly at desks, attempting to process abstract information that they are not developmentally ready to understand. Piaget, in his study of how children mature to think, noted the differences between the Concrete Operational vs Formal Operational stages with those differences being described as follows. I can virtually guarantee that many students, delayed for years or more for various reasons, in their entry to the Formal Operational Stage, will be branded as stupid by the system, (or made to feel stupid for no fault of their own) when it is the system itself that does the devil's work. The particular irony that will be noted by those familiar with the history of the manual arts movement is that manual arts were originally promoted by many as a means to bring the poor and ill-equipped into school where they might prosper, and then become academically engaged. It was noted that manual arts training did not take away from academic pursuits, but instead, reinforced them, particularly for those students who saw no value in abstract learning. During the same time frame in which standardized testing took over American Schools, manual arts training was eliminated. How dumb was that? Today in the wood shop, I will be installing hinges in a demonstration box to illustrate a particular type of hinge for a product review in Fine Woodworking. *I am not myself a believer in the devil. I believe instead of calling to the higher angels, of which you may become one. I have begun framing my thoughts and planning for a one day education symposium for the Oregon Woodworking Guild in which we hope various educators will gather, get acquainted with each other, and conspire. In preparation for that I called my friend Miguel, the director of the North Bennet St. School in Boston to get an update on their youth programming. I was pleased to learn that they continue to work with a few very local schools where the students can walk to NBSS. They learned that bringing students by bus is out of the question, but they have programs in wood working, jewelry making and book making. I also talked with a newer friend in Indianapolis, who, with partners, has the noble idea of adding maker spaces to every school in Indiana. Here I quote from a personal email I received from David Henry Feldman on the state of American education and its problems. My own point of view about education is that it has gone lopsided, understandably, because of the number of kids who are unprepared for school and who don’t know how to do school work. So the system puts most of its resources into trying to get all kids at least well enough prepared to do the work up to a minimum standard. The other, in many respects more important, purpose of education is to help each child find his or her true path. The goal tends to be relegated to after school or out of school activities. The preoccupation with ‘standards’ also has a dampening effect on this second, more sacred, purpose. Without denigrating the very real challenges of insuring at least a minimum of competence in all of our students, if we don’t also celebrate the uniqueness and distinct potential of each student, and if we don’t guide each one toward a life well lived, we may win the battle but lose the war. When shop classes were first started in American schools, (and as I've explained before) there were two compelling reasons. One was that we were becoming an industrialized nation and were in need of skilled hands. The second was that it was then realized that making beautiful and useful things bound the child to higher purpose, in the same manner as would engagement in the arts. I can describe (and often do describe) the many non-economic benefits of doing real things and most specifically working with wood. 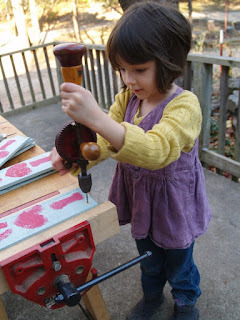 For example, on Wednesday, I had my upper elementary school students turning wood on the lathe. Lily had done a beautiful handle for her small hammer. It was smooth. There were no tool markings and the shape was well conceived. She looked at me and stated, "I am very proud of this." But she did not need my guidance in her self-assessment. She knew precisely why it was good work. Moments later I heard her complimenting a younger student. "That's very good Ana." And so what I'm describing is not just quality of work. I'm describing the quality of the person doing the work. In less than a minute, Lily had self-assessed, expressed pride, and from the stand-point of her own success had encouraged another in her work. This is not to say that similar things don't happen in the arts and in music and in theater, or in other areas in which students are encouraged to do real things instead of labor senselessly on abstraction. The loss of wood shops in schools was not because they are no longer needed, but because the true purpose of them was misunderstood. We regain that understanding, that wood shop, the arts, and music are essential, when we take note of the essential role of the hands in learning. The hands form the bridge between abstract thought and the real world. Without their engagement the mind will never arise to its full capacity. I find it somewhat ironic, that if what Dr. Feldman says is true, schools ignore the developmental needs of so many kids because so many come to school ill-prepared for learning. For the very odd thing is that manual arts training was once considered by some to be what you do with kids who are ill prepared for academics. In any case, I teach woodworking and love it. Make, fix, create, and extend to the others the capacity to learn likewise. On Thursday at Clear Spring School two students went into the office and insisted that our Head of School accompany them onto the playground to pick up something from the ground that they dared not touch. It was a loaded handgun, in tiny holster, no larger than a child's toy. The gun was turned over to the police with the assumption that it had been carried onto the campus by a workman and dropped from his truck. We are fortunate that our kids are so smart. On the other hand, it is unfortunate that others can be so stupid about guns. If I were to know who that particular person was, I would ask a few questions that might apply to others as well. "Why would you need such a thing? How would having such a thing be of benefit to you, or your community? And what in God's green world are you so frightened of, that you would need to carry a loaded gun and then allow yourself to handle it in such an irresponsible manner?" If one is frightened, there are more reasonable ways to manage that. If one is simply a coward and needs a gun to feel safe, I would suggest therapy. Guns are concrete representations of terrible potentialities that should remain, as much as possible in the abstract. I have a strong suspicion that one of the reasons that so many folks have such an overwhelming fascination with guns is that in schooling, their hands have not been allowed to serve fully in forming the necessary bridge between the concrete and abstract. It has been proven that those who have been stopped from counting on their fingers have a tendency to count on fingers their whole lives, but those who are allowed to count on their fingers more quickly outgrow the necessity of doing so. With regards to wood shop, who would be so powerfully drawn to destructive capacity if they were fully engaged creatively through the use of real tools. Otto Salomon had a very clear notion of how the concrete and abstract were to be managed in relationship. The Work Should Not Involve Fatiguing Preparatory Exercises. This brings before us the important educational principle of proceeding from the Concrete to the Abstract. It is, unfortunately, too true that, in the ordinary school subjects, we have generally gone from the Abstract to the Concrete. It is also unfortunately true that systems of manual work have been started which proceed in the same uneducational way. The children begin straightway either to make the drawings, or to work from the drawings already made. In Sloyd, we are so heterodox as not to begin by working from the drawing —which is an abstract thing—but from the model—which is something concrete. A glance at an object tells the child far more than a glance at the drawing of it, and it is by appealing to as many senses as possible, and not to the eye alone, that observation and intuition are most readily cultivated. From Concrete to Abstract is also from Easy to Difficult. A child learns much more from seeing and handling a particular table or chair than from descriptions or pictures of them. The experience of a concrete object involves experience of all the senses, and thus fit with the teaching of Pestalozzi, but it is rare these days that educators speak of the concrete or the necessity that all the senses be engaged. On another subject, we have begun planning an education day during my visit to Portland Oregon in March. 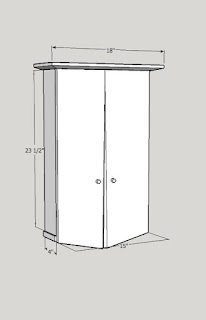 During most of the week I'll be teaching classed in box making and making small cabinets. But on one day, I am to meet with educators about the Wisdom of the Hands program and how to bring the hands into play in education. Today in the wood shop, I will be sanding some of my production boxes getting them ready to fill orders in the spring. Make, fix, create, and extend to others an understanding of the value of learning likewise. Yesterday in the wood shop at Clear Spring School, my students walked into class, gathered their guitar parts and went straight to work. I had my hands full answering questions. "Is this OK? Am I doing this right? What do I do now?" I direct some of their questions to their own capacity to observe, for authority must at some point come in their own hands. How does the neck feel as you move your hand down its length? If you move the rasp this way instead of that, what are the results and how do they differ from the results you have gotten so far? I sometimes briefly take the tool and demonstrate what I mean. Sometimes I warn, "Slow down and examine what you've done so far." The students, almost without exception, are excited about the project, because they see it to have potential use to them and because they see their own ideas taking shape in it. Today in my own wood shop, I will be applying Danish oil finish to boxes and lining the insides. Boxes I finished yesterday morning are shown in the photo above. This morning I used the search function in this blog (upper left) to find what I had written about Carl Malmsten, and found a blog post related to how I use Educational Sloyd in the Wisdom of the Hands program at Clear Spring School. Finding that creative edge may be useful to anyone wanting to incorporate the spirit of sloyd in their school. Educational Sloyd was not intended to be as rigid as it may have seemed to those incapable of exploring its depths. Yesterday in the wood shop at Clear spring School, Oen worked on his boomerang (and had to run outside to test it several times), Keelie made necklaces for friends, and my other students made tools for mineral prospecting during their upcoming trip across Arkansas. My upper level students worked on their box guitars. In the wood shop I have not been practicing "Sloyd," per se, but am reliant on the Theory of Educational Sloyd. As I mentioned yesterday, it takes a certain mental maturity to move from the concrete to the abstract, as documented by Piaget. We must stimulate and not stifle children's activity, and set it pleasantly coursing along the channel which will lead to habits of work. "The child is father of the man," and if we would get rid of the drones and parasites in society, we must teach children not only to work, but to love work. As work, then, is necessary both for our individual and social comfort, it is important that the work should be done through love of itself, and not through love of adventitious aids, since one who does not love any particular work for its own sake, cannot do it in a right spirit or in the best possible manner. Now, one great advantage of Sloyd is that we find it is a subject which is enjoyed on account of its own intrinsic merits, and needs no extraordinary incentives to urge the scholar to pursue it. No rewards are needed, no extra tasks are imposed as punishments; but, on the contrary, if from any cause punishment is necessary, strange to say, a part of the Sloyd time is taken off, and the pupil, suspended from his work, is sent home earlier than usual—a proceeding he regards as a severe punishment. The prejudice against manual work is being surmounted: children love it in spite of the ban of society, which sentiment has first to be overcome. Today I am working on a proposal for next year's ISACS conference that I am basing on one I made in Finland in 2008, "Tools, Hands, and the Expansion of Intellect." In the wood shop, students will work on their box guitars. a stone from a gravesite. The following is from Susan Blow's Symbolic Education, describing the profound effect Pestalozzi had on the development of humane schooling. Pestalozzi lets us into the secret of his life and work when he says, "Through my heart I am what I am." He was an educator because he was a philanthropist. He pleaded for universal education because he saw therein the only effective means of lessening human misery. As he tells us in the Song of the Swan, he "desired at first nothing else than to render the ordinary means of instruction so simple as to permit of their being employed in every family." Searching for the elements of particular branches of instruction, he was led to ask what were the prime elements of all knowledge. Finding in number, form, and words the "alphabet of knowing," he sought to supplement it by an "alphabet of doing," but in the attempt to find the elements of technical skill he was confessedly a failure. From the search for the elements of knowledge and skill there was an easy transition to the thought of the germinal activities of mind and to the definition of education as the "development of inherent powers." Finally, enlightened by the endeavor "to psychologize education," Pestalozzi perceived that "the forces of the heart, faith and love, do for immortal man what the root does for the tree," and that "the center and essential principle of education is not teaching, but love." You will likely not find any of the current crop of educational reformers speaking in such ways. But I think one might see in this quote the profound effect that Pestalozzi had. Otto Salomon kept a stone from Pestalozzi's gravesite on his desk as a reminder of how schooling must be made to work in order to be most effective. I am trying to get to a point of explaining the profound relationship between the concrete and the abstract. The stone on the desk (just as I keep a stone from Salomon's gravesite on my own) is a concrete symbol of a whole lot more. But let us take Oen as an example. He wants to make a boomerang, and I helped him to assemble the outward shape of the thing. How, then, can he shape the edges to bring it from a rough form to one that sustains flight? I'm directing him to look very closely at a boomerang that works, and not roll his eyes when I try to explain the principles of aerodynamics. We are near always distracted by the concrete, and neglect to look deeper. For example, when studying Educational Sloyd people see the model series, all carefully arranged and executed (either poorly or with skill) and overlook the underlying exercises that are never illustrated in such concrete form. By focusing on the underlying exercises, consciously or unconsciously, Salomon had applied himself to developing Pestalozzi's alphabet of doing. The failure to comprehend abstraction, and the failure to go deeper into our understanding of things is the basic error of our civilized population. And that, my friends, is used to enslave populations. In the woodshop today we will be making cigar box guitars, boomerangs, and tools for rock prospecting. The photos above are of my first one string "panjo," a near useless instrument in my own hands, but one that might provide some fun for others. The idea of it was to demonstrate techniques and experimental process. My Teachers were hide-bound pedants, without knowledge of man’s nature, or boy’s; or of aught save their lexicons and quarterly account-books. Innumerable dead vocables (no dead language, for they themselves knew no language) they crammed into us, and called it fostering the growth of mind. How can an inanimate, mechanical gerund-grinder, the like of whom will, in a subsequent century, be manufactured at Nurnberg, out of wood and leather, foster the growth of anything; much less of mind, which grows, not like a vegetable, by having its roots littered with etymological compost, but like a spirit, by mysterious contact of spirit. Thought kindling itself at the fire of living Thought! How shall he give kindling, in whose own inward man there is no live coal, but all is burnt out to a dead grammatical cinder? The Hinterschlag professors knew syntax enough; and of the human soul thus much; that it had a faculty called memory, and could be acted upon through the muscular integument by the application of birch rods. I think you can see why I like colorful old texts. You have to work at them at least a bit to discern their meanings. Can you visualize a mechanical gerund-grinder? What a completely unlovely and useless machine that would be. Would it not be better to have teachers inspired toward more creative usefulness? Is there a reason that a man who teaches poetry, not be a potter as well, drawing his metaphors from the wheel and from the clay, just so? That what he teaches be drawn too, from the inspiration of real life? Today in the wood shop at Clear Spring School, we will continue making box guitars. I am working on my third guitar and a "panjo." In the meantime, we have most of the details worked out for my week of woodworking with the Portland Woodworking Guild from March 18 through March 25. I will supply contact information for anyone wishing to attend. In 1984, Ted Sizer published his classic book, Horace's Dilemma, that explored the American high school experience. Unfortunately, educational policy makers chose to push things in the least appropriate direction as they have often done. One thing you learn from woodworking and through the application of mind (and hands) to the real world is that materials may be used to advantage as in planing with the grain, or to distinct disadvantage when one forces one's way through against the grain. So some sensitivity and application of attention is required. A friend of mine is an antique dealer and had invited me to examine a chair he assured me was made in the sixteenth century. I asked if I could turn it over and look underneath, at which time it was revealed to me that it could not have been made at such an early date. The stock underneath had a very large chunk of wood torn out by a power plane, whereas no craftsman with normal strength could have done such a thing and only by purposely going against the grain with inordinate force. The amount of strength required to remove such a large chunk would have been huge and unavailable in the time before power driven tools. So schools intended for the efficient delivery of information run roughshod and amok on children and their sensitivities. A close examination of our kids and their attitudes about learning and about schooling may reveal that they have been powered through the process of schooling without sensitivity to their grain. In the illustration above, you will note the craftsman's posture. He aligns himself carefully, and squares himself and the tool to the stock. What if our teachers had time for such careful alignment? Last night, they held yet another largest ever Powerball jackpot drawing. It again failed to produce a winning ticket, even though millions of tickets were sold. Now the next jackpot will be well over 1 billion dollars, so you know once again, Americans will be hoping that the machine delivers to them in the most personal of ways... showering them with money they have done nothing to earn. The lottery is a devilishly devised way to get people to acquiesce to a system run by an elite. My wife asked me how they know there were no winners without allowing time for winners to come forward with their tickets. I assured her that the machine knows. In school, I have one girl who, having made a bow and arrows, insists there is nothing more I can get her to do with wood. That may be shortsighted of her, and she is abundantly skilled, but I have allowed her to take an alternative course that is more interesting for her and that supports the interests of the class at large. She has become our story reader. Just as cigar makers would hire someone to read and keep his employees engaged and alert, my student is reading to her class. The current text is E.M. Forster's "The Machine Stops." Published in 1909, it should be read by all those who've become overly dependent on digital technology, not only because of the precariousness of our predicament, but because of the insight it offers into the human soul. The lead character Kuno, who had become bored with the machine, had discovered to his complete amazement that "man is the measure," which is one of those things we should be teaching in school. But in order to know your own place in the measuring of things you have to get up from your desk. If you look at the use of standardized testing and the machine at the core of standardized education, you will see a direct parallel between this modern time, and that which Kuno in the story hopes to escape. Without wood shop, without music, without the arts, without the hands to test principles in mathematics, history and science, we might as well just prop everyone up in similar chairs and sell them lottery tickets, that they might hope at some time in their lives to be delivered from the machine. The following is from Susan E. Blow who founded the first public school kindergarten in the US. The greatest mistakes in education are rooted in the failure to recognize and conform to the different stages of natural development. Educational theorists are constantly pointing out this error; educational practice is constantly repeating it. Notwithstanding all that has been said and written, we still make knowledge our idol, and continue to fill the child's mind with foreign material, under the gratuitous assumption that at a later age he will be able, through some magic transubstantiation, to make it a vital part of his own thought. This is like loading his stomach with food which he can not digest, under the delusive hope that he may be able to digest it when he is a man. It is forcing the mind to move painfully forward under a heavy weight, instead of running, leaping and flying under the incitement of its own energy and the allurement of its own perceived ideal. The attempt to force a premature activity of reason can result only in repulsion of his sympathies and the stultification of his mind. – Symbolic Education, Susan E. Blow, 1894. The preceding was written in an attempt by Blow to explain and promote the educational philosophy of Friedrich Froebel, and if you have your wits about you, you may notice that Froebel and Blow had discussed stages of learning and development long before Piaget was even born. Thus it was in the early days... Educators made profound observations that were thence soundly ignored, and educational policy makers developed schooling that had a complete disregard for the developmental issues facing each child. If a single child was run over by a subway each day, the nation would be clamoring for change. But the fact that huge numbers of children are run over in school each day by educational policies run amok, seems to be of no concern at all. A friend of mine, Mario, reminds me that very few educators will defend the machine that they serve daily. All appear to see the chinks in it and the damage it does. And so, perhaps I need to work a bit on clarifying my proposal. We need to push back on the machine. Remove it from our lives for extended periods, and reclaim the development of mind that comes when attention is cultivated and applied. The drawing above is for a class I will teach in Portland in March. My Wisdom of the Hands program was mentioned in an article in Independent School Magazine, the quarterly publication of the National Association of Independent Schools (NAIS). Clear Spring School is a member of the NAIS through our regional affiliate, ISACS, Independent Schools of the Central States, the association of independent schools that grants our accreditation. The issue of Independent School that contains the article is Winter, 2016, and I was alerted to the article by readers who had found their way to the blog by reading it. The most important point buried in Comenius' quote is the phrase, "now as this is very useful, it ought not be restrained." And the point is that our best leverage on boys learning is to make use of their most natural inclinations. There's a saying that you can't push a rope, but you sure as hell can pull one to very great effect. By ignoring the nature of boys, we create education that is destructive, ineffective and least efficient. But if we were to use their natural inclinations to our best advantage, schooling would become both efficient and undamaging. What Mogel's article alerts members of the NAIS to is the fact, that our current model of schooling is not only ineffective as suggested by Comenius, it is destructive. And how would I know about that? I was one of those young men in an earlier time, who feeling squelched by schooling, left for school each day having hurled up my breakfast and with knots gnawing where nourishing food should have been. My own experience in the subject is "first hand." I made it through my own crisis in schooling with the help of a doctors visit to assure there was nothing physically wrong, and the counseling and support of my mother, a professional kindergarten teacher. I could point my readers to a dozen of my blog posts on this subject. One can be found here, My Daughter Loves School. The odd thing is that educators have become more reliant on statistical modelling and standardized tests than on what they could see before their very eyes were they to look, and I find this to be disconcerting. Educational policy makers would rather sustain environments in which children must be drugged to cope, than attempt to modify a system that is torturous, ineffective and corrupt. At school, I have been shaping guitar necks. In my home workshop, I have been applying Danish oil to boxes. Make, fix, create, and extend to others, please, the opportunity to learn likewise. Those who study and have studied child development will tell you that children's bodies, muscular capacities, and minds grow and develop within a range of what is termed "normal." For instance, and as I've mentioned many times before, if your child walks at 10 months your pediatrician will say that it's normal and not to worry (and that no particular genius is assured). If your child walks at 14 or 16 months the very same pediatrician will tell you, that too, is very normal. In fact, I can give the names of children who chose not to walk until as late as 18-24 months whose development and intelligence, and physical capacities are well within the upper side of the normal range. But when it comes to schooling, we put kids in classes and expect them to read on a clock and panic when they are not performing at "grade level." I raise a toast to late bloomers, may we all unite against the stupidity* of American education!!! A couple days ago, I mentioned Piage's theory of stages in child development. Student performance is in part controlled by the body/mind's capacity to engage in concrete vs. abstract learning. But the truly stupid thing is that kids are moved up or behind in class, and assumed to be stupid or smart (or are led to make the same wrongful assumptions of themselves) when there are simple developmental differences having to do with the rate of growth from level to level. For instance, the formal operational stage is not a thing all children reach automatically and magically at age 11, as though hands on a clock. Instead, it comes between the ages of 11-15, a four year span of time during which some students would inevitably be labeled by the Procrustean bed of public education as intellectually inept. If the range of walking can extend nearly a year or more, how can we possibly assume putting academic pressures to learn on children as early as third grade should be considered anything but an outrage and a crime? This is not to say that children should not be encouraged to learn at whatever rate their current capacity might allow. But one must never assume that any particular child might not completely surprise you with both their character and intelligence and at any time, given a reasonable chance at it. Schooling at its best (and in order to do less harm than good) must be structured to allow not only for differences in learning style, but also to accommodate variations in the developmental process. As you noticed from yesterday's post, I have been reading Henry David Thoreau's Walden. I have to wonder why people were so smart in the 19th century and so vacuous today. Can it be that they had slightly less to think about, and so gave what they had deeper thought? And that by giving things more thought, and deeper thought, were more thoughtful and reflective about their own lives, the lives of others and the world they lived within? It might be worth slowing down to find out. And one sure way to do that is to craft something (with your own hands) beautiful and useful, that might become treasured for a lifetime. *Please forgive me for being so blunt. There are 39 easy-to-find synonyms for the word stupid, and I could have been more creative and perhaps less strident had I but chosen online resources to do so. I know that in speaking so bluntly I may appear both snobbish and insulting to some. But buck up and bear with. My use of the word stupid in relation to education is no more unpleasant than what hands-on learners have long suffered and endured under the oppressive grip of being "'schooled." Yesterday in the wood shop at Clear Spring School yesterday, 7th and 8th grade students worked on box guitars, some building the bodies and some moving on to shape the necks. In the image above, one can see that schools were not always what they are today. I take the personal risk of your disfavor by insisting that things may have gotten worse. In one of Piaget's tests having to do with the formal operational stage, students were asked, that if they had a third eye, where would it best (and most usefully) be placed on their bodies? Students still in the concrete operational stage usually suggested at the center of the forehead. In contrast, a student in the formal operational stage, suggested it be located in the hand so that he could use it see around corners. In a sense, the hands already offer a perspective of reality that has come to be wrongly and ruthlessly ignored in schooling. Hands do see around corners and under things in ways modern educators have become stupid about. Yesterday in wood shop at the Clear Spring School I had a remarkable day. Students made a buck saw of their own design from materials found in the woods and a section of old band saw blade. One make a knife ground from another piece of bandsaw blade, and my lower elementary school students made wooden Japanese style flip flops. Other students worked on their box guitars. The last I saw Oen during the day he was running with shoes and socks off toward his parents car, wearing the wooden shoes he had made. He could not possibly be more pleased by with what he had accomplished. The following is from Henry David Thoreau's Walden Pond, one of the classics of American literature that is promoted for consumption by American high school students but ignored completely by educational policy makers. The student who secures his coveted leisure and retirement by systematically shirking any labor necessary to man obtains but an ignoble and unprofitable leisure, defrauding himself of the experience which alone can make leisure fruitful. "But," says one, "you do not mean that the students should go to work with their hands instead of their heads?" I do not mean that exactly, but I mean something which he might think a good deal like that; I mean that they should not play life, or study it merely, while the community supports them at this expensive game, but earnestly live it from beginning to end. How could youths better learn to live than by at once trying the experiment of living? Methinks this would exercise their minds as much as mathematics. If I wished a boy to know something about the arts and sciences, for instance, I would not pursue the common course, which is merely to send him into the neighborhood of some professor, where anything is professed and practiced but the art of life; — to survey the world through a telescope or a microscope, and never with his natural eye; to study chemistry, and not learn how his bread is made, or mechanics, and not learn how it is earned; to discover new satellites to Neptune, and not detect the motes in his eyes, or to what vagabond he is a satellite himself; or to be devoured by the monsters that swarm all around him, while contemplating the monsters in a drop of vinegar. Which would have advanced the most at the end of a month, — the boy who had made his own jackknife from the ore which he had dug and smelted, reading as much as would be necessary for this, — or the boy who had attended the lectures on metallurgy at the Institute in the meanwhile, and had received a Rogers' penknife from his father? Which would be most likely to cut his fingers? – Henry David Thoreau, Walden Pond. And so what Thoreau is more than hinting at is that those, ALL THOSE, who are denied a hands-on education are denied learning in depth and the expenditure for that education is an enormous waste, not only for the students in their deprivation but for the culture at large. I am talking with one of my publishers today about a short book on making cigar box guitars, and yesterday I began work on a "panjo" made from a bread pan acquired from our local thrift store. Make, fix, create, and extend toward others the chance of learning likewise.